The building of the Charlak passenger catamaran at the international seaport of Turkmenbashi is about to be completed. 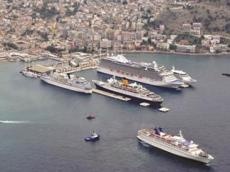 This will enable Turkmenistan to organise sea cruises, the Neutral Turkmenistan newspaper reported. This type of ship with 350 seats is being built there for the first time. The work is being assisted by specialists from Turkey. The project was produced by Turkish shipbuilder DEARSAN (SHIPYARD). In the first place, Charlak is intended for a shuttle service for the Turkmenbashi-island Kizylsu-Hazar route. Piers and passenger terminals are built at the point of departure and intermediate stations. However, as stated in the article the cruising range of 400 nautical miles (or 740 kilometres) will enable the organisation on the catamaran for sea cruises as well. The ship's commissioning is expected in late April. The catamaran has a length of 37.8 metres and a width of 8.9 metres and is equipped with electronic control equipment with a satellite navigation system. The vessel can reach speeds of 30 knots, or more than 55 km / h, the article said. Because of the low draft of 1.2 metres, the ship can dock almost anywhere along the Turkmen coast. Assembly materials are delivered on a makeshift shipyard by water from the city of Tuzla, located 20 kilometres from Istanbul on the Sea of Marmara. The launch of Charlak and preliminary mooring trials are planned for late January of this year. That will be followed by fully loaded sea trials to be undertaken by the ship.